Anne Huntington, Vice President of Business Development for Huntington Learning Center and active second generation of the founding family is one of the female leaders at growing companies recognized for entrepreneurship and giving back and growth orientation. "Making an impact on students and families every day is a great way to earn a living." 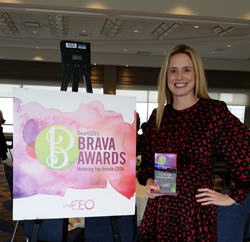 Anne Huntington, vice president of business development at Huntington Learning Center, has been named a SmartCEO 2017 Brava Award winner. Ms. Huntington is one of an elite group of high-impact female business leaders in the region who combine entrepreneurial spirit with a passion for giving back to the community, and whose companies have demonstrated remarkably consistent growth and performance. As the active second generation of the Huntington Learning Center founding family, she is carrying on its mission into the future, which continues to propel the company to achieve both world-class results for students and franchisee success. Since its founding in 1977 by her parents, Ray and Eileen Huntington, Huntington Learning Center’s mission has remained the same: to give every student the best education possible. As the nation’s leading tutoring and test prep provider in the K-12 market, Huntington helps students achieve the skills, confidence and motivation they need to reach their potential. Huntington began franchising nationally in 1985 and has now surpassed the 300 center market, with locations in 41 states across the country. This means more students and families can benefit from the industry-leading results in math, reading, writing, science, study skills, test prep and more. Going forward, Ms. Huntington sees the opportunity to expand the Huntington Learning Center’s reach, implement technology in new and exciting ways, and expand the tutoring and test prep programs through strategic partnerships. To learn more about Huntington’s franchise opportunities, email Franchise(at)HLCmail(dot)com, call (800) 653-8400 or visit http://www.HuntingtonFranchise.com. Huntington Learning Center is the nation’s leading tutoring and test prep provider. Its certified teachers provide individualized instruction in phonics, reading, writing, study skills, elementary and middle school math, Algebra through Calculus, Chemistry, and other sciences. It preps for the SAT and ACT, as well as state and standardized exams. Huntington programs develop the skills, confidence, and motivation to help students succeed and meet the needs of Common Core State Standards. Huntington is accredited by Middle States Association of Colleges and Schools and Western Association of Schools and Colleges. Founded in 1977, Huntington’s mission is to give every student the best education possible. Learn how Huntington can help at http://www.HuntingtonHelps.com. For franchise opportunities visit http://www.HuntingtonFranchise.com.